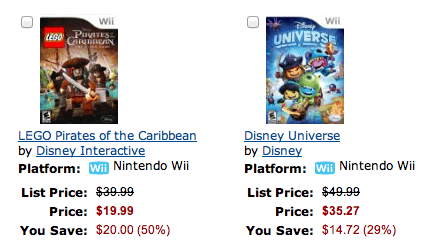 Amazon has select Disney Interactive video games on sale for up to 50% off! You'll find titles for the Xbox 360, Wii, Playstation 3 and Nintendo DS consoles. With titles like LEGO Pirates of the Carribbean for $19.99, this could be a good opportunity to buy for an upcoming birthday or special event.